Can't connect to Office 265 using Outlook? 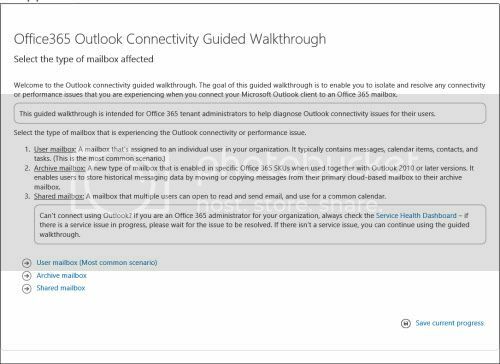 This Outlook connectivity guided walkthrough is intended for Office 365 tenant administrators to help diagnose Outlook connectivity issues for their users. The goal of this guided walkthrough is to enable you to isolate and resolve any connectivity or performance issues that you are experiencing when you connect your Microsoft Outlook client to an Office 365 mailbox. This Guided Walk Through (GWT) will help you in troubleshooting Outlook Connectivity issues in Office 365.
http://forum.thewindowsclub.com/micr...tml#post169512 may also interest you.